Today’s Friday’s Featured Food comes from Malaysia. It wasn’t just the food that made me want to write this post today – it was the location too! 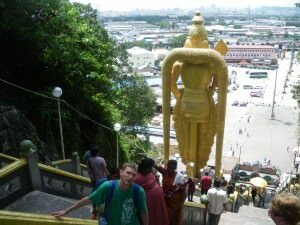 I visited the Batu Caves in Malaysia in 2009 after a night train from Singapore, and checking into our hostel in Kuala Lumpur. Just before heading into the caves and doing the sightseeing, it was time for a mini feast. I didn’t realise it was going to be a meal I remembered and would be writing about 4 years later. In fact, it doesn’t seem like 4 years, seems longer…plus I’m not a food freak so I don’t even know if this meal was actually a curry, but to me it was! It was a Malaysian curry on a leaf! But we found a local restaurant and when checking out the menu it was time for me to order what the waiter recommended, I tend to eat locally at least once when I’m in a new place and after ordering and relaxing, this “beast of a feast” arrived. I’m calling it Malaysian Curry on a leaf. That’s my name for it. The meal itself might in fact be Indian. 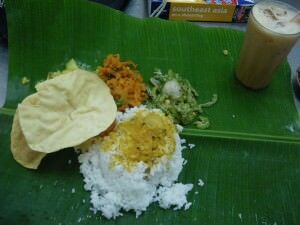 But I ate it by the Batu Caves in Malaysia and it came on a leaf. 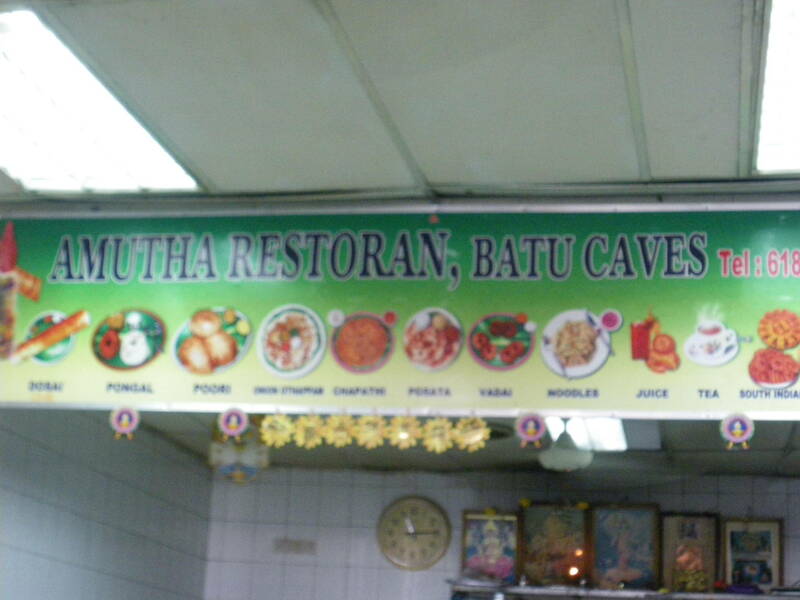 Our Restaurant at Batu Caves was called Amutha Restoran. What was in my “Malaysian Curry on a Leaf”? 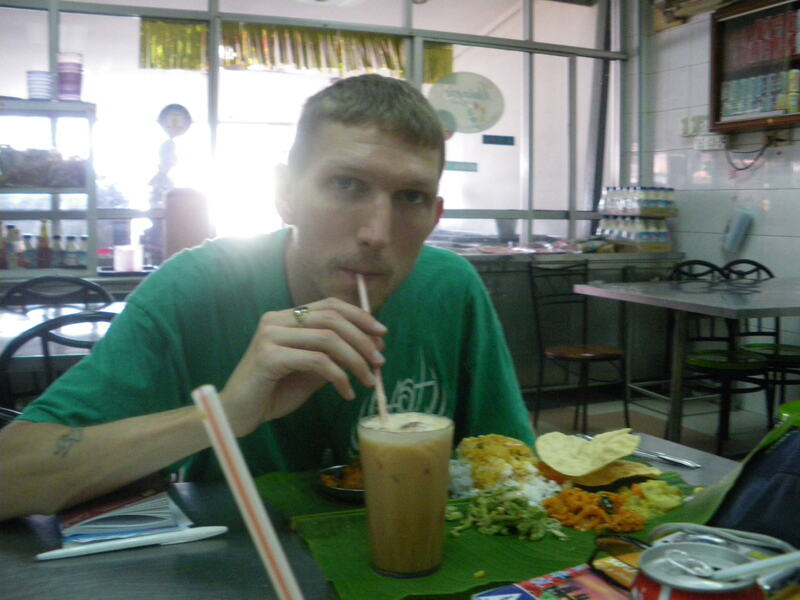 Sipping tea to cushion the spicy blows of the excellent Malaysian Curry on a leaf at Batu Caves. What did my Malaysian Curry on a Leaf taste like? The Malaysians might not want to hear this but it didn’t taste that much different to fake curries I used to attempt to make as a student when I lived in England. It had the same sauce, meat, ingredients and side dishes! But that said, it was delicious and went down a treat in fact I couldn’t finish it! 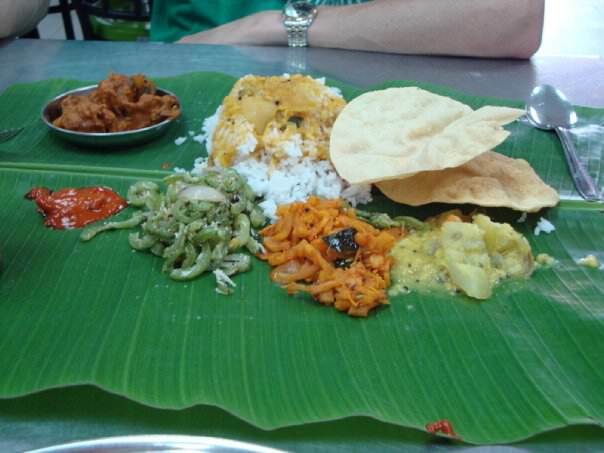 It’s well worth trying a spicy Malaysian curry on a leaf at Batu Caves! Where can you buy this Malaysian Curry on a Leaf? 2. It’s popular for tourists and locals who visit Batu (one of my travel buddies Chaz also had it on his trip there and devoured it). 3. 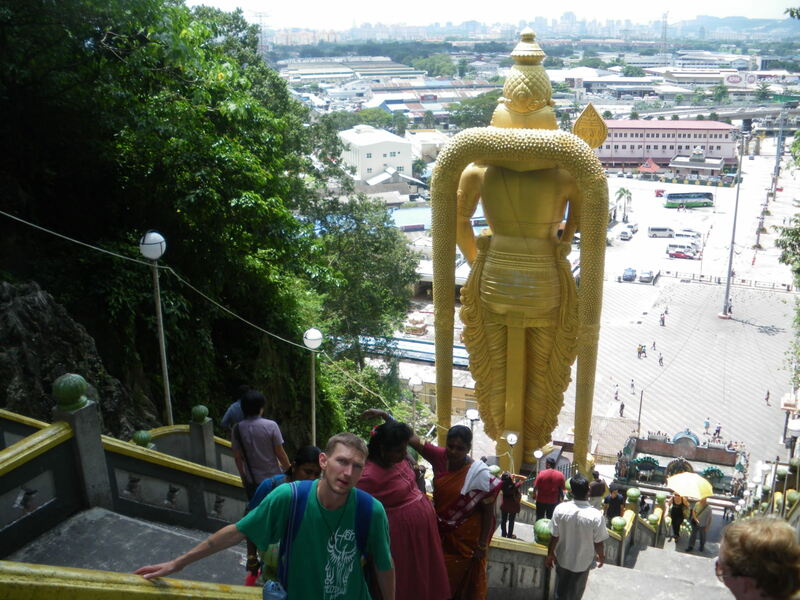 You save time looking round for it – guaranteed the restaurants at the foot of the Batu Caves will have it. 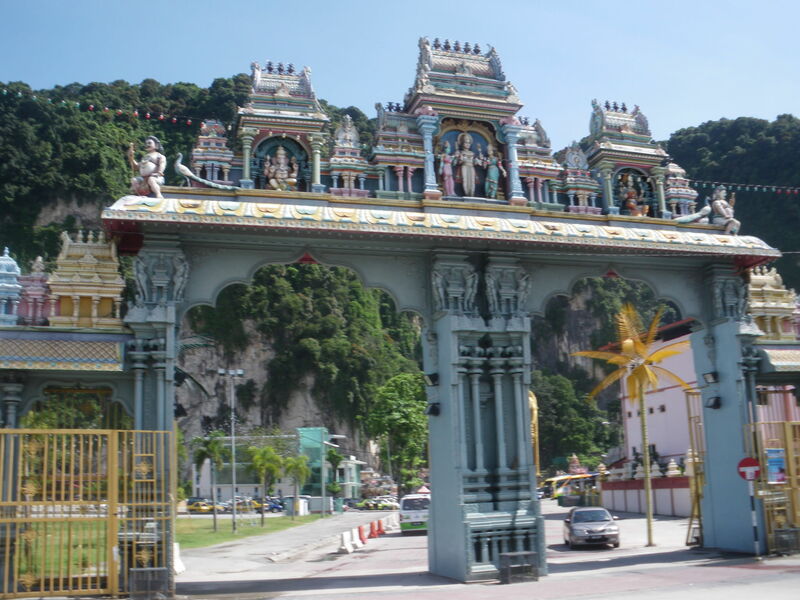 In terms of finding restaurants at Batu Caves – they are all at the foot of the Caves entrance on the right. Fairly unmissable. We went to Amutha Restoran Restaurant. If you’re not making it to Batu, Kuala Lumpur is full of English speaking people in restaurants – just ask them for it if you want to try it. 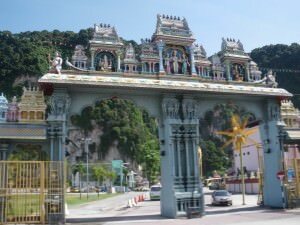 On the right hand side past the entrance to Batu Caves are a load of restaurants including the one where I ate the Malaysian Curry. How much should you pay for the Malaysian Curry on a Leaf? I always find Malaysia a cheap place to go, but this is quite a special meal and so you’ll pay around $4 US Dollars for it. Don’t forget you’re at a touristy zone. Still dirt cheap and worth a punt. Wash it down with a cup of iced tea and a beer. Everything is payable in cash and in Malaysian Ringitts. Either carry toilet roll or at least be ready for a toilet experience. This spicy curry works its way through your system fast, trust me! This entry was posted in Asia, Batu, Daily Features, Destinations, Friday's Featured Food, Malaysia. Bookmark the permalink.